Identity management is an important part of the Enterprise Security. Identity Management systems will add an additional layer of protection by ensuring user access policies and rules. Identity Management provides IT Managers with tools and technologies for controlling user access to critical information within an organization. 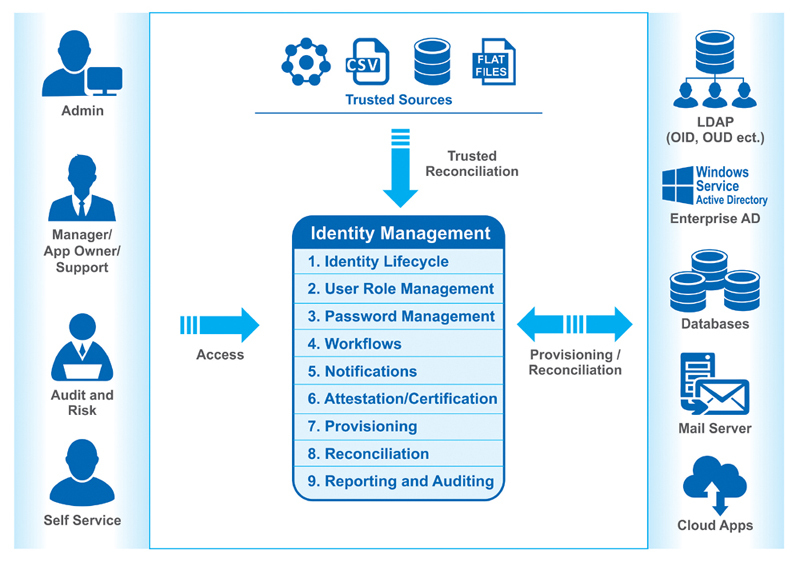 Identity Management makes it easier to manage the Lifecycle of an Identity for Organizations. The core objective of Identity Management is One Identity per individual. Once the digital Identity has been established, it must be Maintained, Modified and Monitored throughout each user’s Identity Lifecycle. It will be easy to manage this on a small scale, but it’s very challenging to do on a large scale. It’s not feasible for a team of people to manually maintain all of the changes to identities, so Identity Management is implemented to make this easier to do. Ojas being an IdM Specialized Company and a strong IdMCoE team on board, would be a right partner for your Security systems Implementation needs. We help you build a strong security systems using proven cost effective models. IAM addresses the mission-critical need to ensure appropriate access to resources across increasingly heterogeneous technology environments including mobile, social and cloud, and to meet increasingly rigorous compliance requirements.Ojas Innovative Technologies is specialized in the implementation of identity and access management Solution which includes identity management, access management, identity federation and mobile & social. Ojas has the expertise required to deliver solutions and enable organizations to effectively regain control of their users, applications and data. Ojas team with its Technical Expertise and Business Skills is capable of developing mature IAM Solutions and reduce the Enterprise Identity Management costs so that Enterprises can become significantly more agile in supporting new business initiatives. End to End Implementation - Ojas can help the organizations enhance the security by developing an effective Identity and Access Management Solution. Ojas offers end-to-end Identity Management implementation by evaluating and recommending the solution, Architect and Design to meet the Customer's specific needs. Ojas also helps its customers by supporting them until BAU. Customization - Ojas has highly experienced IdM team with extensive Java knowledge who can help the Organizations to build and customize the Connectors as per the business needs. Ojas team also have the experience in developing Web Services for automating On-boarding and Off-Boarding process. 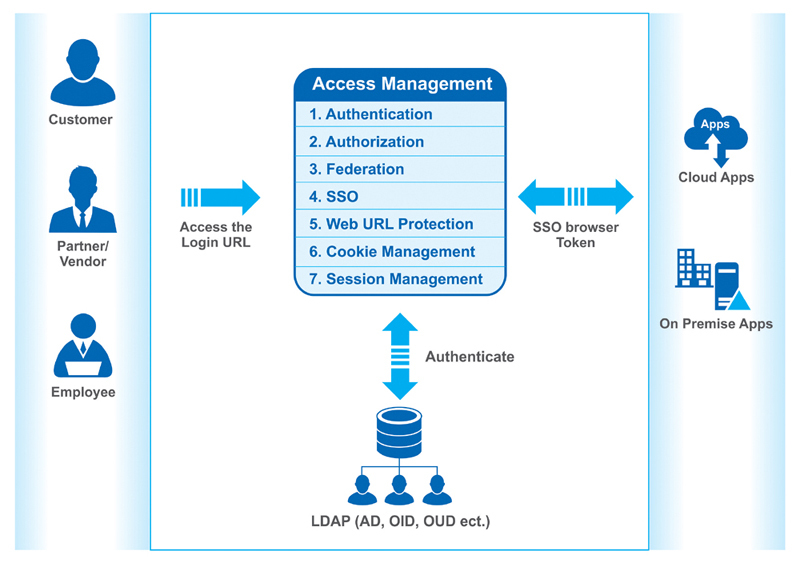 Single Sign-On (SSO) Implementation - Single Sign-On (SSO) simplifies the management of user IDs and passwords, both for users and administrators. It enables users to access systems and applications by logging on only once (Authentication) and use the credentials to determine the actions that one can perform based on the user rights (Authorization). © 2011-2018 Ojas Innovative Technologies. All Rights Reserved.